This procedure is a new, innovative, non-surgical treatment that uses gentle pulses of light combined with low radio frequency energy to improve the appearance of skin, specifically wrinkles, redness, sunspots, pigmentation, sun damage, dilated capillaries and rosacea with no down time. This relatively painless procedure is performed in a series of five or more treatments combined with microdermabrasion to achieve maximum improvement. 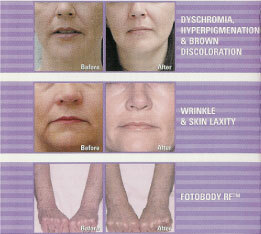 The result of Foto Facial RF™ is smoother, clearer, healthier, more youthful skin. FotoFacial RF™ treatments are full face, neck, hands or body treatments using Intense Pulsed Light and Radiofrequency energy combined in the same pulse. These gentle, no-downtime treatments are used to improve the cosmetic appearance of the face, neck or body. The original FotoFacial™ procedure was codeveloped by Dr. Patrick Bitter, Jr., a dermatologist and Dr. R. Stephen Mulholland, a plastic surgeon, bringing together the best of aesthetic dermatologic skin care and cosmetic plastic surgery into one non-invasive procedure. The FotoFacial™ procedure has increased in popularity and recognition to the point where it is now one of the most commonly performed cosmetic procedures in North America. Dr. Bitter and Dr. Mulholland have trained over 2,000 physician practices in the art of the FotoFacial™ and the procedure has been featured in Allure, Cosmopolitan, In Style, Vogue, USA today and numerous national and regional Television shows. Many Hollywood stars and TV personalities rave about the FotoFacial™ and credit this procedure for the renewed health and vitality in their skin. The FotoFacial RF™ is the next generation in high-tech skin enhancement. Rosacea, flushing, redness, ruddy complexion, broken capillaries and spider veins of the face. All these "Pink" vascular based conditions of the skin improve on average between 50-75% percent with FotoFacial RF™ treatments. Sun spot, age spots, hyperpigmentation, melasma, cholasma, mask of pregnancy, multiple freckles. All these "Brown", melanin based conditions of the skin improve, on average, 50-75% with FotoFacial RF™ treatments. Chronic sun damage and photoaging improves with FotoFacial RF™ by 50-75% with FotoFacial RF™ treatments. Wrinkles and Skin Laxity. Unlike other more basic forms of Photorejuvenation, the FotoFacial RP™, with its synergy of simultaneous Intense Pulsed Light and powerful Radiofrequency energy produces industry leading non-ablative wrinkle and skin laxity improvements of up to 70% without downtime; a claim that no other device or procedure has been able to boast. All patients notice a consistent improvement in the appearance of their skin. The degree of improvement is gradual and persistent over the 15-18 week program and 5-6 FotoFacial RP™ treatments. The noticeable and significant changes that have been reported include: Improvement in pink and brown discoloration, spider veins, pink and brown blemishes, sun damage, age spots, pore size, acne scarring and wrinkles. The degree of improvement can vary but averages 50-75% improvement in anything that is Pink and Vascular or Brown and Melanin in nature. The improvement in fine to moderate wrinkles, acne scarring, skin texture irregularities, laxity and smoothness is 50-75%. How does the FotoFacial RF™ differ from Photorejuvenation procedures? In marrying Intense Pulsed Light and RadioFrequency energy into one treatment, FotoFacial RF™ treatments offer the very latest and most effective high-tech, non-invasive form of skin enhancement. Many other lasers and devices, such as N-lite®, Cooltouch®, SmoothBeam®, V-Beam®, IPL photorejuvenation or Intense Pulsed Light systems with the Quatum® or Vasculight®, claim to deliver state-of-the-art photorejuvenation. With these basic Photorejuvenation procedures you may notice a degree of improvement in the appearance of some aspects of your skin. However, by combining RadioFrequency and Intense Pulsed Light into one FotoFacial RF™ treatment, you will achieve the optimal degree of enhancement to all components of your skin. By adding the RadioFrequency to the Intense Pulsed light, the FotoFacial RF™ procedure can now boast excellent, no downtime wrinkle improvements together with the significant improvement in redness, rosacea, pinkness, spider veins, pores and texture. The FotoFacial RF™ treatments are simple, office based treatments. The patient is covered with a thin layer of cooling gel and the entire face, chest, hands or arms are treated with a gentle pulse of light and Radiofrequency energy. Each treatment takes about 30 minutes and involves pulses of bright visible light and Radiofrequency energy that are passed into the skin. Because each FotoFacial RF™ treatment is gentle, most patients require 5 or 6 FotoFacial™ treatments to see the desired results and they are performed every 3 weeks. In certain skin types, a microdermabrasion is performed between FotoFacial™ treatments to enhance the penetration of the light and Radiofrequency energy. Each pulse of the FotoFacial™ device sends two types of energy into your skin, Intense Pulsed Visible Light and RadioFrequency energy, that act synergistically to enhance the skin. Energy is given up to brown spots, blood vessels, and redness to gradually and gently lessen or eliminate these blemishes. The RadioFrequency energy also produces significant amounts of collagen, elastin and ground substances, the thick undercarpet of the skin, resulting in a noticeable and significant smoothening of fine to moderate wrinkles and textural irregularities of the skin. Will the FotoFacial RF™ treatment hurt and have to miss work? The FotoFacial RF™ treatments have a tolerable level of discomfort. The discomfort can be greatly reduced, or even eliminated by the use of a topical anesthetic cream applied to the skin 30 minutes prior to the scheduled FotoFacial RF™. After each treatment, patients can apply makeup and return to normal activities. The FotoFacial RF™ treatments have proven to be low risk, are associated with few complications and patients rarely have downtime or have to miss work or regular activities. At the completion of the FotoFacial RF™ program the skin will have achieved a noticeable and consistent degree of improvement that the majority of patients are very happy with. Occasionally, some patients desire an even greater degree of improvement and these patients will sign up for additional procedures. Most FotoFacial RF™ patients will just desire to maintain the nice skin enhancements they achieved from the program and, for these satisfied patients, a single maintenance FotoFacial RF™ treatment is recommended every 4 months to keep the skin looking vital, even, smooth and youthful.